Wildfire Pepper Spray is 18% Oleo Resin Capsicum (pepper)...a derivative of 3 Million Scoville Heat Units (SHU), as opposed to normal pepper sprays which are usually 2 million SHUs. 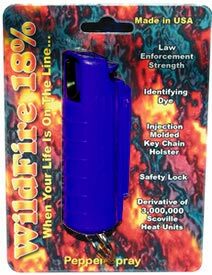 Our Wildfire 18% pepper spray with keyrings is offered in 2 different sizes for your convenience, the a convenient 1/2 ounce, and the larger 1 1/2 ounce size! Both units come with a belt clip, keychain and safety switch. The 1/2 ounce size comes with an injection molded poly holster. If you are going to be forced to pepper spray someone, why not REALLY let em' have it, and simply ruin their day? A blast of Wildfire in the face, will give even the most aggressive attacker pain and blindness they won't soon forget! 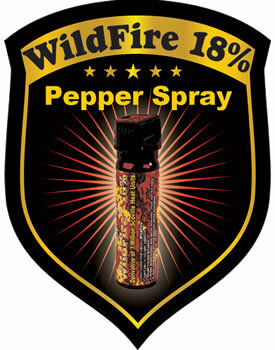 Wildfire Pepper Spray has proved to be the hottest pepper spray by many studies, hands down! 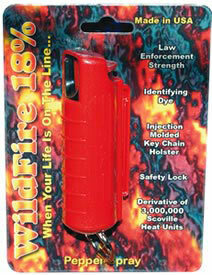 This Wildfire 18% Pepper Spray can be delivered in 3 to 5 business days. If you would like to receive your order sooner, guaranteed 3 day, 2 day and next day delivery options are available upon checkout. Orders placed by 2:00 PM central time ship the day they are placed. If you have any questions or concerns call our customer support staff at 800.960.2015 or click the live chat button at the bottom of this page. Our courteous and professional customer support team is always glad to help!